Amazing Tonner Doll of actress Helena Bonham Carter as Iracebeth, the vile Red Queen. From Tim Burton's Alice in Wonderland. Your friends will lose their heads when they see this in your collection! "Off with their heads!" Helena Bonham Carter breathes extraordinary life into Iracebeth, the vile Red Queen in Tim Burton's Alice in Wonderland. 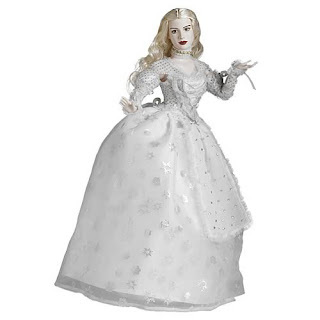 This phenomenal doll from Tonner captures her unique, authorized likeness and comes clad in rich gown with a soft, flocked bodice, gleaming stomacher with contrast stitching, high-standing collar, slim lamé sleeves with ruche overlay and ribbon trim, a decadent brocade skirt with custom heart embroidery on the front inset panel, full petticoat, custom printed card-suit tights, lace-up faux-leather gold boots with black lace overlay, and a jeweled crown. Your friends will lose their heads when they see this in your collection! Anne Hathaway is a vision of beauty as Mirana, The White Queen. 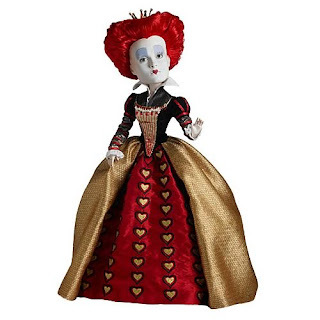 Doll based on Tim Burton's Alice in Wonderland movie. A truly spectacular Tonner Doll for your collection! In Tim Burton's Alice in Wonderland movie, Anne Hathaway is a vision of beauty as Mirana, The White Queen. Her likeness is exquisitely captured in this breathtaking Tonner Doll that arrives wearing a frothy white confection, sprinkled with silver snowflakes and trimmed with glittering mesh and silky ribbon. The dress is accented with a glittering chiffon apron and downy chiffon bow in the back. Around her neck, she wears a shimmering necklace of rhinestones, trimmed with net ruffles. Pantyhose and white faux-leather boots are also included. A truly spectacular doll for your collection! amazing! they look so much like the actors too!